To make the smoky chilli butter, place the butter, paprika, sugar, chilli, garlic, salt and pepper in a small food processor and process until smooth and combined. Set aside. To make the feta and mint topping, place the feta in a bowl and, using your fingers, finely crumble. Add the lemon rind, salt and pepper and mix to combine. Set aside. To make the ricotta salata, lime and coriander topping, place the ricotta salata, lime rind, coriander, salt and pepper in a bowl and mix to combine. Preheat a char-grill pan over high heat. Cook the corncobs for 8 minutes, turning, or until charred and just cooked. Brush 2 of the corncobs with the mayonnaise and roll in the ricottasalata mixture. Spread 2 of the remaining corncobs with the smoky chilli butter. 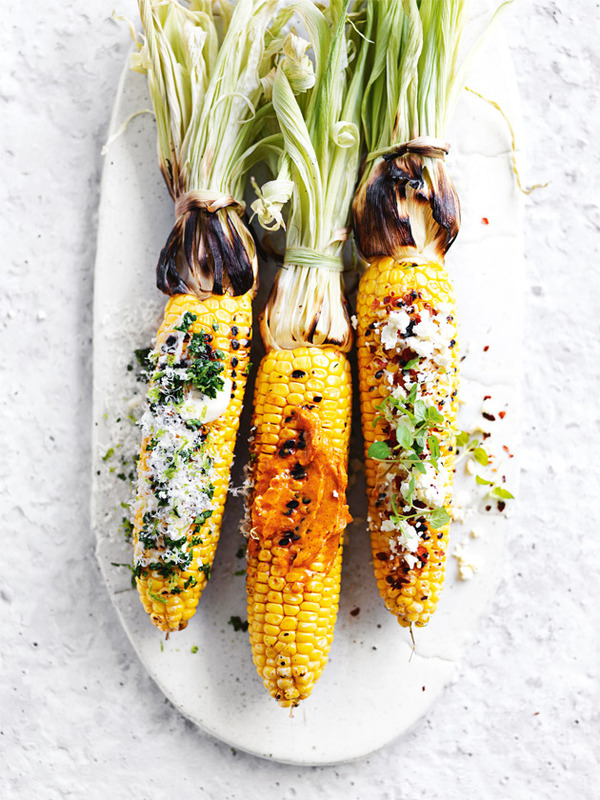 Sprinkle the remaining corncobs with the feta mixture and top with chilli and mint to serve. Makes 6. Tip: You can make any of these toppings in advance – just keep in a sealed container in the refrigerator until ready to use. + Ricotta salata is a salted, aged and pressed ricotta, perfect for shaving, slicing or crumbling. It’s available from delicatessens and cheese shops.